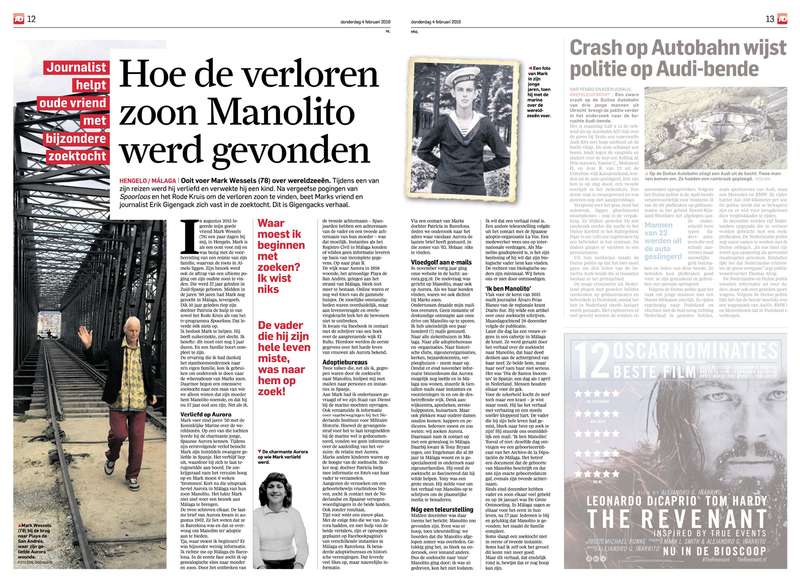 Article about the successful search in the Dutch national newspaper AD. In August 2015 my friend Frederik (78) stayed with me in Hengelo for a few days. He was preparing a reunion of his family whose roots lie in Almelo. His visit also became the kickoff of an ultimate attempt to find his eldest son who was born in the south of Spain 57 years ago. In the mid eighties Frederik himself had sought for Manolito in Málaga, but in vain. At the beginning of this century he has enlisted the help of both the Red Cross and the Dutch tv program ‘Spoorloos’ (Missing), both without result unfortunately. I gained the experience with the genealogical research for my own family, and that of my wife who was born in Indonesia. I could very well use this experience into the whereabouts of the son of Frederik. And thus began an intensive search for a man of whom we knew only that his mother called him Manolito, and that he is now 57 years old (like me). In the late fifties Frederik traveled the oceans with the Navy. On one of the trips he met the charming young woman Aurora. During his next leave Frederik again went to Spain to visit his lover. The stay with the now pregnant Aurora became an extended one, and thus he returned late to the Navy. The Navy court-martialed him for his absence and sentenced him to six weeks imprisonment. Shortly after the verdict Aurora in Málaga gave birth to their son, Manolito. Because Frederik served his sentence and after that resumed his service in the Navy, he didn’t manage to visit Málaga soon. Meanwhile, they corresponded through letters. 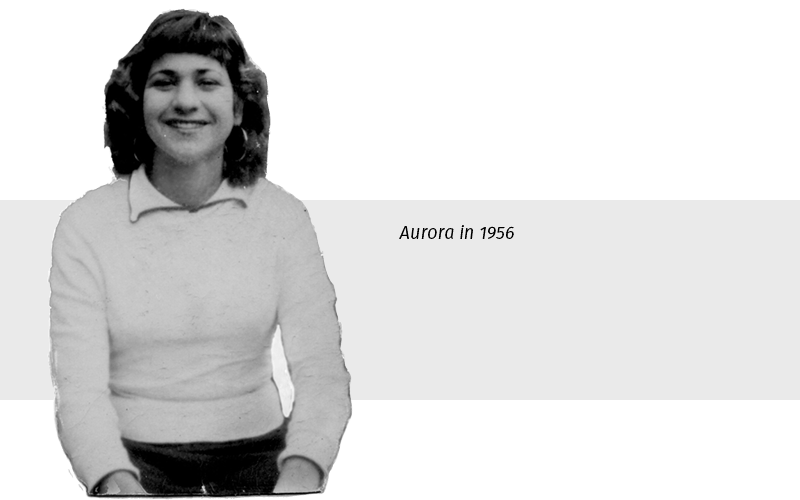 The last known letter of Aurora came in August 1962. (The letter itself was lost, only the envelope was still there.) Aurora had told in the letter that she was in Barcelona at that time and that she had considered offering Manolito up for adoption. In the 57 years after, father and son never met. However, they always longed for each other and later on searched for each other. Both sides possessed so little information (me too) that finding each other was very difficult. 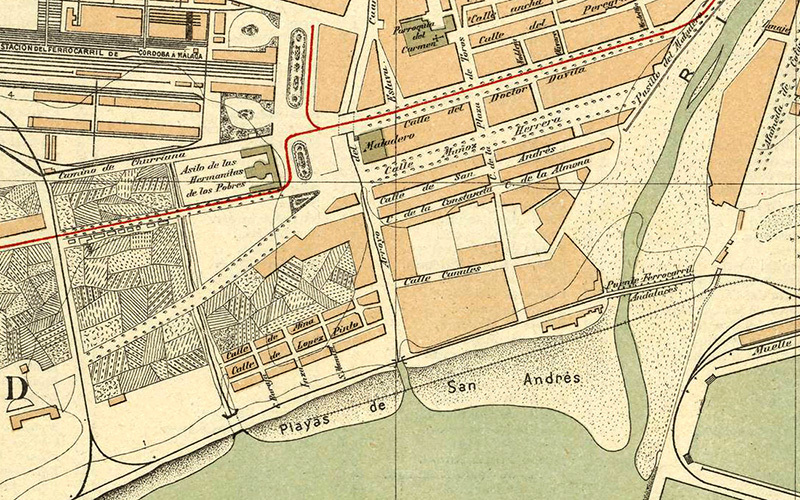 In my research I focused from the beginning on both Málaga and Barcelona. In the first phase, I got on the Internet, especially on genealogical sites, looking for mother and son. But because of the absence of the second surname (Spaniards have a surname of the father and a second last name of their mother) it was difficult to find specific details. Agencies such as the Registro Civil in Málaga could not or would not provide information on the basis of incomplete data. I had to shift the focus. 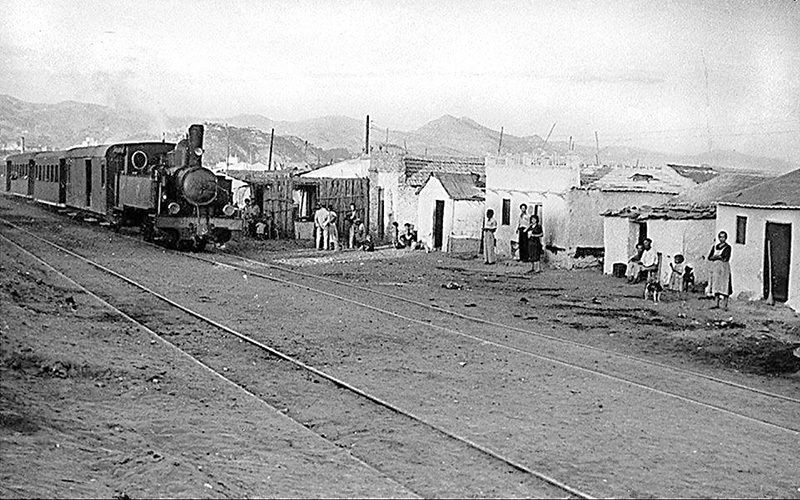 The neighborhood where Aurora lived in 1958, the shabby Playa de San Andrés, located on the beach of Málaga, proved not to exist anymore. Online there still are pictures of the ramshackle houses. The difficult conditions were clear, but the joy of living and the strength to survive wasn’t missing in the occupants. On Facebook I came in touch with the author of a book about the adjacent neighborhood El Bulto. In this way we got the first data about the hard life of women like Aurora. In those first weeks I had sent English e-mails to organizations and individuals in Spain, but I realized that I’d get more responses with Spanish text. During online inquiries about English-Spanish and English-Catalan interpreters, I came into contact with two interpreters who wanted to do the translation free of charge because they were fascinated by the search for Manolito. Meanwhile I had asked Frederik if we could have his Naval Service Record, and I arranged the required form. I also inquired at the Dutch Institute for Military History (NIMH) about shipping movements. Later on I requested additional information from the Defence archives in Kerkrade. Though imprisonment for returning too late in the navy was well documented, we found in the documents no information about the reason for the omission: the love affair with Aurora. In the Netherlands, the other children of Frederik were aware of the search. Daughter Patricia was closely involved in the research and helped with information and photographs of her father. Since the requests for a birth certificate has remained fruitless, I made contact with the Dutch and Spanish representations in both countries. This in the hope that they could give a decisive ‘push’ in the search for a birth certificate. I was sent back and forth a few times between the two agencies, unfortunately without any result. Once again the investigation needed a new direction. With the only photo we had of Aurora, and with the help of both the translators, calls were posted on Facebook pages of various agencies in Málaga and Barcelona. I approached both adoption agencies and historical societies. This resulted in many ‘likes’ but little information. Enveloppe from the last letter from Aurora, 1962. 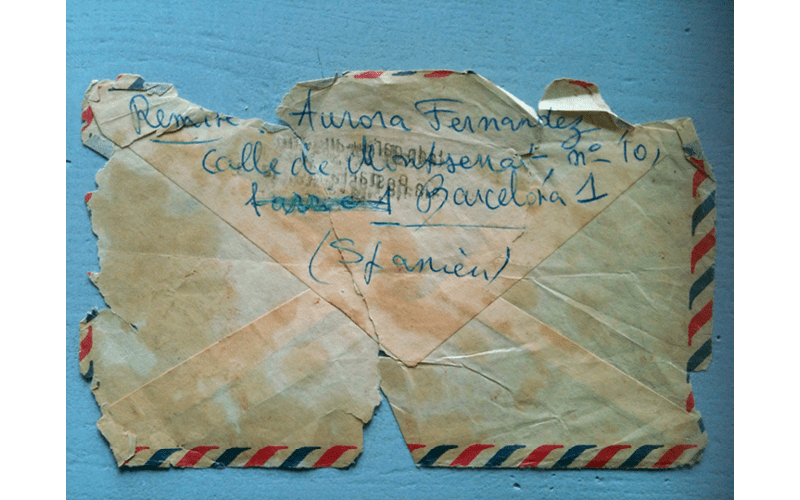 Through a contact of Frederik’s daughter Patricia in Barcelona we have investigated the address from which Aurora has sent the last letter in the summer of 1962. The house is close to the Columbus statue at the beginning of the famous shopping street La Rambla. Unfortunately, this yielded no new information. After two months of searching fruitlessly the idea emerged to enlist the help of local and regional media in Málaga. But first we wanted to give more publicity to our research ourselves and we opened up a website on November 23, 2015: aurora.gyg.nl. The site was also intended to make it possible for visitors to find more information and to respond. The query was aimed at Manolito, but also on Aurora. If we could find her it would undoubtedly help to get more information about her and Frederik’s son. At this stage of the research I gave the e-mail traffic a massive surge. No organization or expert escaped from our drive to find Manolito. Finally I sent a couple of hundred e-mails (in Spanish or Catalan) to: all hospitals in Málaga, all possible adoption agencies and organizations, historical clubs, gypsy organizations, churches, senior centers, nursing homes etc. I received information at the end of November that Aurora may still be alive, and living in a particular neighborhood in Málaga. I sent dozens of emails to organizations and facilities in and around the relevant area, such as community centers, pharmacies, first aid stations, general practitioners. But also to other points that(older) people must visit sometimes, like hairdressers, pedicures and more. To put even more force on the searching of genealogical sources, I went looking for a genealogist in Málaga, to gather information on the spot. That was the moment I ‘approached’ Tony Bryant. Tony is an Englishman living in Málaga for more than 20 years. He specializes in research on gypsy families (and flamenco) and he found this research to be so fascinating that he wanted to help. Tony was a big help. One of the things he suggested was, to write the story of Manolito in his own words and in this way approach the local media. Meanwhile, there was continuous contact with one of the archives: Archivo de la Diputación de Málaga, i.e. the archives of the province of Málaga. We were once again allowed to fill in a form, a sent it back provided with a signature and a copy of my ID. But again the response was negative: The archive needed more precise information to provide help. In mid-December a report suddenly appeared that Manolito was possibly found. This initially hopeful message was accompanied by the announcement that he had passed-away in the summer of 2015. Fortunately, has turned out on closer inspection, this report was not true. This was about a very different person with a northern European father. Another disappointment resulted from contact with the friendly Xabier of the Spanish adoption agency La Voz. He downplayed our expectations dramatically when he drew our attention to international conventions surrounding adoption. If Manolito indeed had been adopted, then it was his decision whether he wants his biological father to find him. The rights and opportunities of biological parents proved to be extremely minimal. We tried not to be discouraged. Just before Christmas 2015, the journalist Álvaro of the regional newspaper Diario Sur wrote us that he wanted to write an article about our quest. I sent him straight to Tony. Both Patricia and I were interviewed and we delivered, on request, some pictures and sayings (quotes) of Frederik. Right after Christmas, on Monday December 28, followed the publication both in the newspaper, and on the website of Diario Sur. The area where Aurora lived in the late 1950s. Click to enlarge image. Coincidence or not, the same day we received a birth certificate of the Archivo de la Diputación de Málaga. It was a hospital document which describes the birth of Manolito and that gave us his exact date of birth and his second name. The listed address of Aurora, Playa de San Andrés 27, proved exactly as was always said by Frederik. The moment that father and son meet after 57 years. Meanwhile father and son have met each other in Málaga. Manolito and the other children of Frederik have frequently contact. Everybody is extremely happy with the discovery of Manolito which makes the family complete. Sometimes a quest doesn’t succeed in first or second instance. But do not give up. This story proves that there can be hope. Si tienes alguna información que pudiera ayudarnos, dirigirla a Erik Gigengack, contacto de la familia: Contacto. Please send your information to Erik Gigengack, contact person: Contact. Thank you Erik for your drive and action in the search for Manolito. You made it possible, and now we know and we gona meet our oldest brother witch was always a big question to us. Fascinating story, Erik. Thank you for giving me the opportunity to take part in that amazing quest. Thank you, Ana, for participating in our quest so we could solve the search for Manolito!